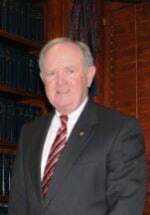 Dennis T. Still has been involved in the general practice of law in Lawrenceville, Georgia since 1977 and a member of the firm of Garner and Still, Attorneys at Law since 1980. He has primarily worked in the areas of Family Law, Real Estate Law, Wills, Estates and Probate Law, Misdemeanor and Traffic Law, Personal Injury Law, and Social Security Disability Law during that time. He has been awarded an AV Preeminent rating, the highest possible peer review rating in legal ability and ethical standards, by Martindale Hubbell since 1996. Dennis has been active in Municipal Law since his appointment as City Attorney of the City of Dacula beginning in 1978 through the current date. He formerly served for 20 years as City Attorney for the City of Loganville. He also served as City Attorney for the City of Auburn. Dennis has been active in the Georgia Municipal Association making numerous training presentations to elected city officials. Dennis is the Past President of the City Attorney’s Section of the Georgia Municipal Association. He has served as the Chief Judge of the Municipal Court of the City of Lawrenceville since 1981. He has been an active member of the Municipal Judges Council of Georgia and is completing his tenth term as Chairman of the Municipal Court Judges Training Council of Georgia. Dennis also served on the Supreme Court of Georgia Commission on Interpreters. He is a past president of the Gwinnett County Bar Association (won the State Bar of Georgia Award of Merit), a member of the Lawyers Club of Atlanta and a trustee of the Gwinnett County Law Library. Dennis has been active as a Judge for the Georgia High School Mock Court competition for over 15 years. Dennis has been an active Rotarian since 1982. He was Charter President of the Rotary Club of Snellville (awarded Small Club of the Year in District 6910 in 1992). In 2006 he was presented the District 6910 Lee Arrendale Award for Vocational Excellence. Dennis served as the Chair of the Georgia Rotary Student Program from 2003 to 2008, at which time he was elected as Chair Emeritus. In 2010 Dennis was named Rotarian of the Year. He is also past master of Lawrenceville Masonic Lodge No. 131, former Secretary of the Hospital Authority of Gwinnett County, former Treasurer of the Gwinnett County Livestock and Fair Association and has served as an Elder in the Presbyterian Church/USA. Dennis is an avid golfer and enjoys snow skiing.